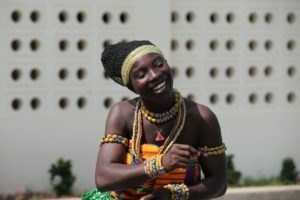 We arrived at Otinibi, about one hour’s drive from Accra, on a mixture of paved and dirt roads, crowded with cars trying to navigate around the people selling everything from fruit to clothing to automobile parts. We could hear the rhythmic beating of the drums as the car pulled up and we waited for the large gates to swing open and let us enter. We parked around the backside of the FFP facility. The four drummers were really going at it, and everyone was in a festive mood. The large white canopy tents had been magically installed in the graveled courtyard since the day before and looked clean, cool, and majestic, with rows and rows of simple plastic molded chairs set out in neat sections for all the 400 plus students, teachers and distinguished guests. The canopies appeared to offer a welcome relief from the direct sun, which at 9 a.m. was already a sizzling ninety degrees, with humidity to match. Soon it became obvious that although the canopies were helpful, they provided a false sense of security. Everyone had beads of perspiration, damp heads and clothing, and we all tried our best to ignore the stifling heat. There was excitement in the air—the founder, Prem Rawat, was coming soon! The children started filing in, wearing clean and freshly starched uniforms. They were amazingly quiet for such a large group of youngsters. I suspect they were in awe of the fair-skinned people who looked different from them in some ways, and of course, all the cameras being set up. While we were arranging the seating, we heard that the Chief of Otinibi and his entourage were attending unexpectedly. 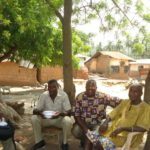 Although he was generous in offering the land to build the Otinibi facility free of charge, I learned that he seldom attends even the most important events. 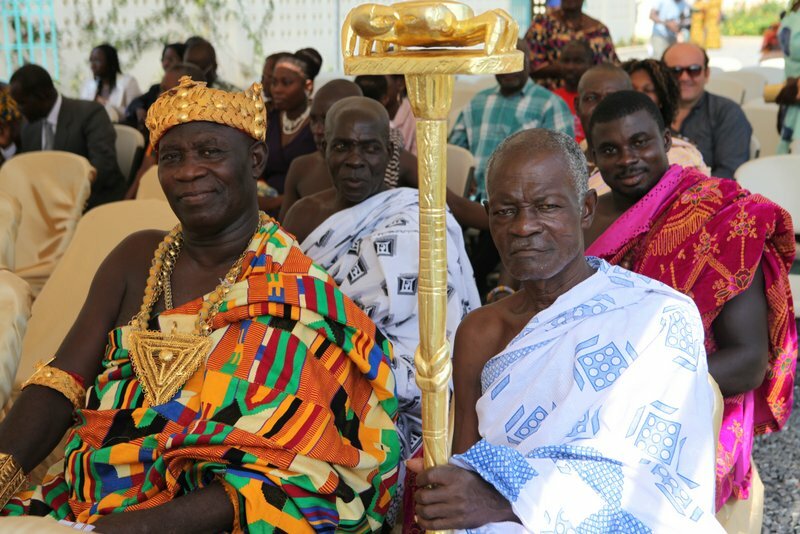 The Ashanti King was sending his most senior advisors to attend the event as well. So we spent some additional time deciding how to seat these honored guests according to protocol. What a handsome and impressive group. The Otinibi Chief was elegantly dressed in his traditional clothing and carried an impressive staff. He and his group also had an air of elegance and authority. The King’s entourage wore colorful traditional wraps and lots of gold! I saw gold crowns, armbands, wrist bracelets, rings, staffs, and gold woven into cloth. Between the sun and the precious metal, the whole place was glittering. Shortly after the audience began to settle, the drummers picked up the pace to welcome Prem Rawat. Dressed simply in slacks and a light blue shirt, Mr. Rawat greeted everyone and took the seat of honor in the middle of the front row. Emmanuel Adjei walked to the microphone to welcome everyone. 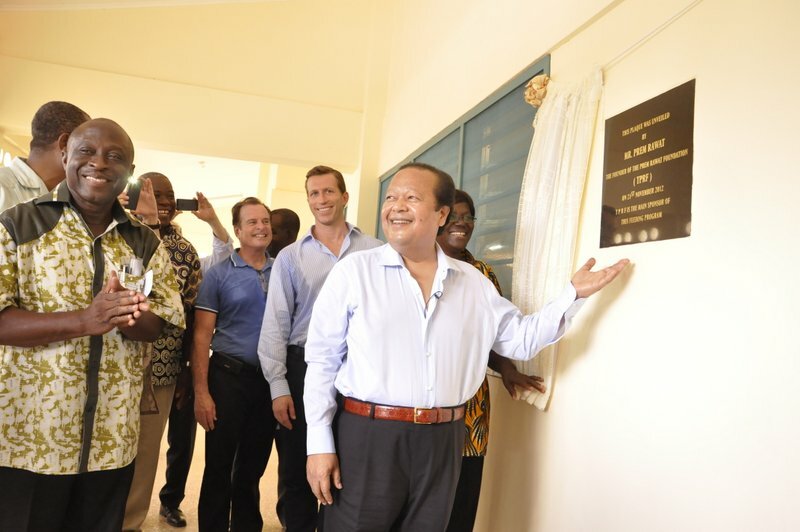 The headmistress, Grace Ninsaw, spoke first about how important this facility was for the community, how the school enrollment had increased by almost 300 since construction began, and how well the children were doing. 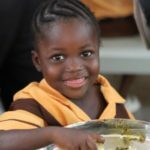 She said that many charities had promised to build a facility to help feed the children, but then never followed through on their promise. 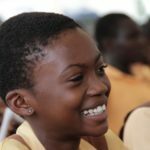 It wasn’t until construction of the FFP facility was well underway that people dared to hope, and then to believe, that there would be such a wonderful place in their community. 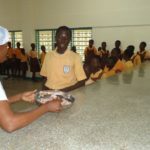 The Otinibi Chief spoke about the difference between the school before and after the FFP facility was built and graciously offered more land to grow vegetables for the program. The Ashanti King’s representative spoke next. He mentioned having attended Prem Rawat’s public event the night before and remarked how pleasantly surprised he was by how much he enjoyed it. 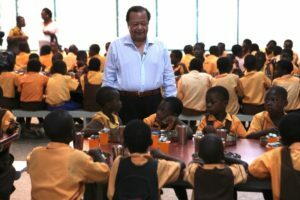 He assured everyone that he would report to the King about Prem Rawat, his message of peace, and the wonderful work that is being done through TPRF, and he offered that perhaps we could work together to build another facility. Then I spoke a little about TPRF, trying not to be self-conscious that I might possibly look as I felt—soaked, head to toe, from the intense humidity. There was some unexpected traditional dancing, which most everyone seemed to enjoy—giggling children and wide-eyed adults alike. 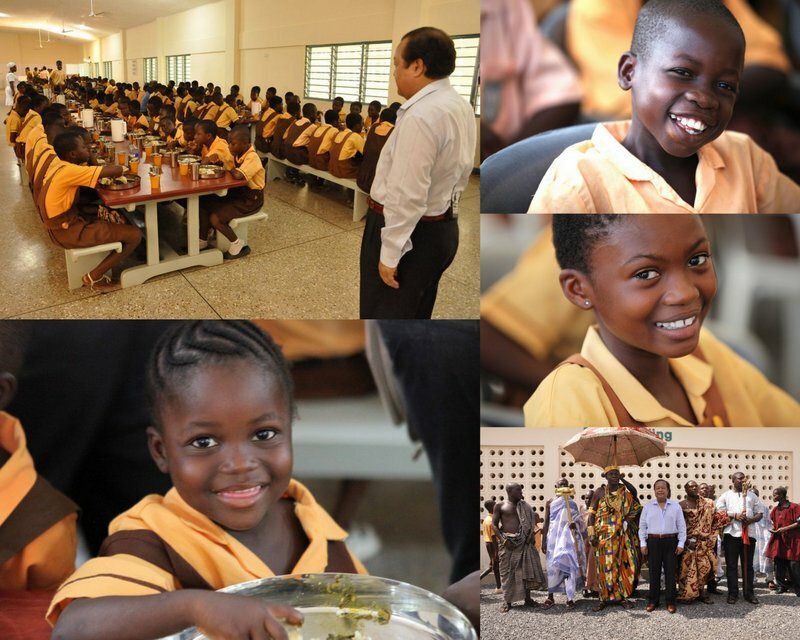 A school skit by the young children thanked Prem Rawat, TPRF, and the Foundation’spartner, PremBaf Ghana (PBG). 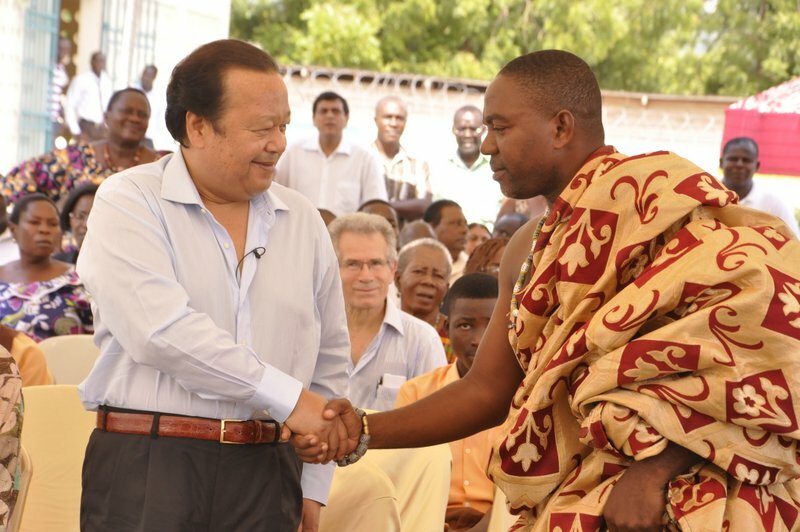 The Chief and the King’s representatives were duly impressed with Prem Rawat’s talk, mumbling their agreement throughout. They wanted their photos taken with Mr. Rawat, which he readily agreed to. Afterwards, they were individually introduced to Mr. Rawat and were beaming with pleasure as they shook hands. The last scheduled event was the unveiling of the plaque, followed by the students beginning their meal. Mr. Rawat walked from table to table, saying hello to the children and asking how they liked the food, which they were obviously enjoying. Then he walked through the facility, looked at the kitchen, the prep rooms, and storage areas. The facility was extremely clean. Mr. Rawat was pleased, noticeably impressed, and stayed an extra twenty-five minutes. It was a wonderful occasion, enjoyed by all who attended. What a glorious day! Soy feliz de colaborar desde Argentina con el mensaje y las obras que realiza Prem Rawat, gracias, cordialmente. Gracias a ti por tu colaboración, Susana. Wonderful! Are there plans for any more FFP facilities in the future? Yes, Dorri. 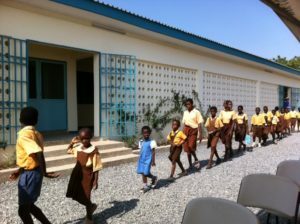 Currently, plans are in the works to increase the number of facilities to six. Wonderful project. Contented children, a happy people. Thank you, Mr. Prem Rawat. The smile on those children’s faces is contagious. Wonderful article. Thank you for this heartwarming story!